UMNO Cybertroopers’ doctored version of Forbes 2016 Ranking of Malaysia’s 50 Richest! #bahanjenaka @umnoonline sudah kasi balik kepada kerajaan itu RM2 juta ? #RezekiHalal. Is Ahmad Maslan a victim of fake news? Kira memang tak de kerja lain lah selain baca WhatsApp aje lah? Dan ini kerja ahli kabinet? Ahmad Maslan gaji buta. Dia tak ada kerja lain. BN cybertroopers getting additional funds for cyber war? Is it from the GST collected? They’re all coming alive online. 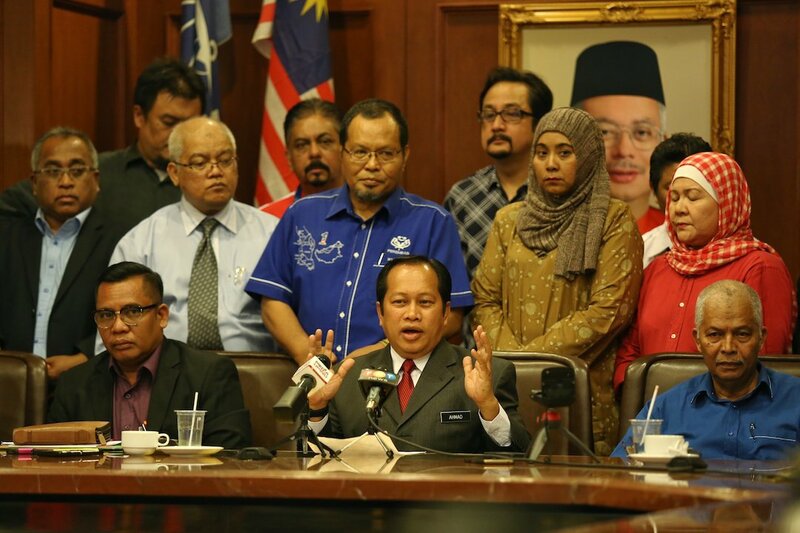 Ahmad Maslan now heads Umno’s IT bureau. He plans to start a new UMNO cyber army. The #2Kerja minister is UMNO’s 3.85 CGPA man. KUALA LUMPUR, March 8 — Ten independent groups and non-governmental organisations today pledged to support Umno by becoming “keyboard warriors” to fend off allegations against Datuk Seri Najib Razak on social media sites. Umno information technology chief Datuk Ahmad Maslan, who chaired a two-hour long meeting with the groups, said he was thankful for their offer to defend the prime minister and Umno president online. “These groups will operate independently to deflect allegations made against the PM with accurate facts and figures,” he told a press conference after the closed door meeting at the Umno headquarters here. Ahmad named Persatuan Jurutera Melayu Professional, Mawaddah Wanita Malaysia, Alumni Kelab Umno Luar Negara, Persona Selangor and Alumni 4B Kebangsaan as among the groups that would supplement to the Umno’s social media team. When asked how the groups would help the Umno social media team, Ahmad said they were to work on their own to counter allegations made against the country’s top leadership. “These groups are not here to spread lies or defame anyone but are here to counter each allegations with facts as Umno does not condone to the act of spreading rumours,” he said. The groups that were present did not wish to speak to the media before the meeting took place, indicating fear that their comments would be taken out of context. Umno cybertroopers and keyboard warriors alike found themselves in a massive #fail yesterday and they misinterpreted DAP strongman Lim Kit Siang’s speech where he said that former Deputy Prime Minister Muhyiddin Yassin is the latest recruit in the ‘Save Malaysia’ agenda. New head of Umno’s IT bureau to form networks to obtain input ‘on things we don’t know yet’. PETALING JAYA: A new army of cybertroopers are being raised by former Umno Information Chief Ahmad Maslan, newly-appointed to head the Information Technology bureau. called for a new group of soldiers, the keyboard warriors, to take up the issue of perception versus reality. In the latest attempt by Ahmad, he said “the IT bureau will forge a friendship with our social media friends to obtain input, especially on matters that perhaps Umno and BN don’t know yet”. He said social media played an important role in determining their success or failure and urged all Umno members to work together in this battle. Besides being appointed IT chief, Ahmad Maslan was also appointed to the Supreme Council member to fill a vacancy created by the death of the late Rompin MP, Jamaluddin Jarjis. Replacing Ahmad as Umno Information Chief is Annuar Musa, MP for Ketereh. Ahmad Maslan changes his hashtag from #2Kerja to #tambahpendapatan BUT THEY’RE STILL MOCKING HIM! This entry was posted in Uncategorized and tagged ahmad maslan, ahmad maslan and new umno cyber army, new umno cyber army. Bookmark the permalink.